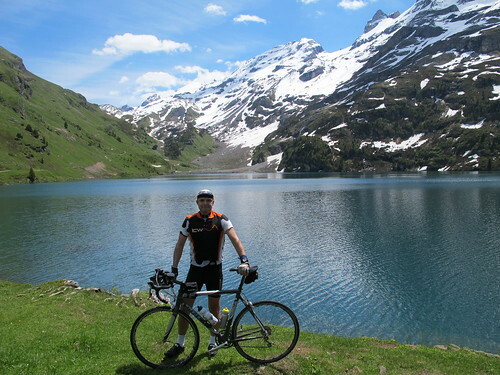 Central Switzerland has some of the highest and most beautiful cycling climbs in the Alps. Here, I’ll discuss the most famous with a few loop ideas, and tips of lesser-known route extensions. I am not trying to make a comprehensive list for the region. However, of course, please feel free to comment on any favourite roads that I have excluded. The red loop on the above map. 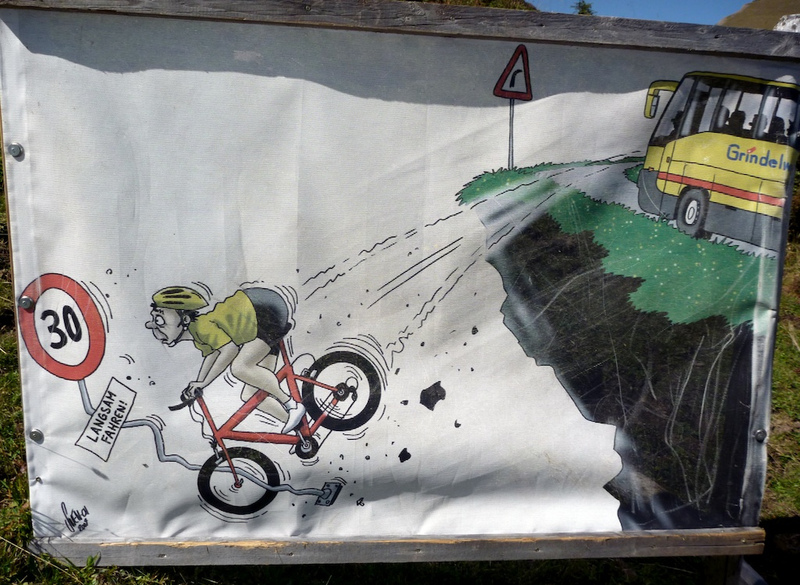 This must be the quintessential Swiss Alp Cycling loop. Note, while it doesn’t matter where you start, the important thing is to ride this loop counter-clockwise. 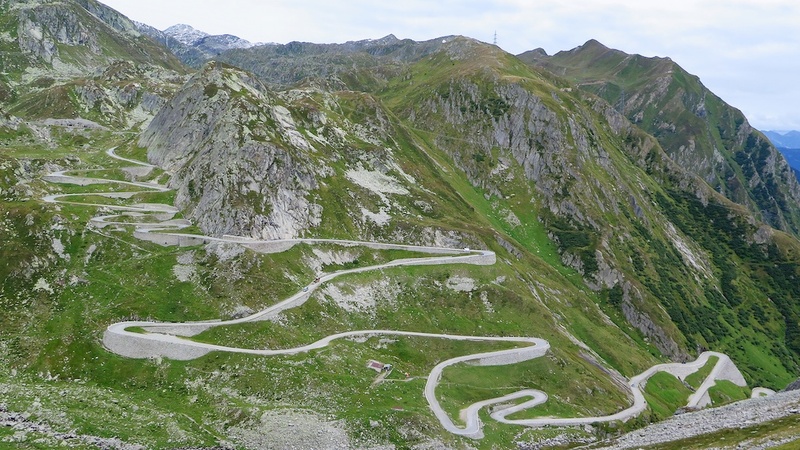 Thus climbing perhaps the better side of Nufenen, and perhaps the less interesting side of Furka, but importantly climbing Gotthard Pass from the south on the truly amazing old Tremola road. Not to be missed (and the north side of Gotthard is by far the least interesting of the entire route). 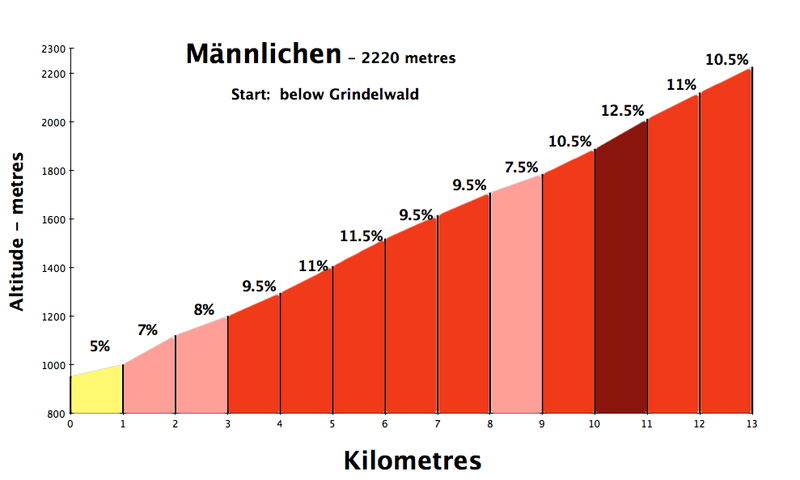 The route mapped above starts in Andermatt, thus beginning with Furka Pass. This is the 4th highest paved road in Switzerland. As I alway mention, it’s this east side where the sniper scene occurred in the James Bond film Goldfinger. See this post for more Furka details and a youtube clip of Bond/Furka. 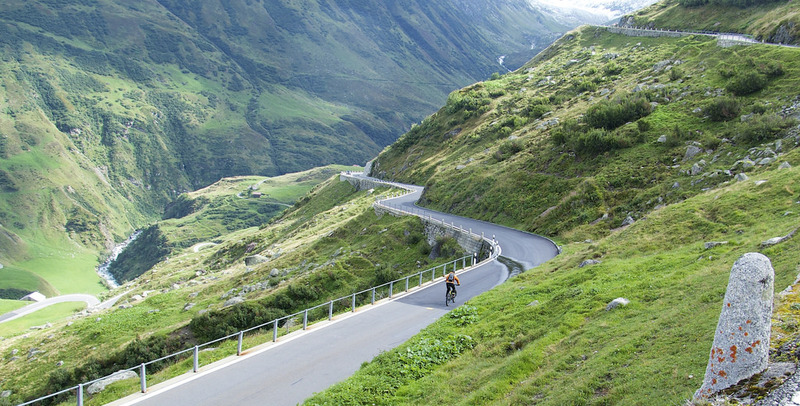 Nufenen Pass, the second highest (2478m) paved road in Switzerland, is a beast of a climb. The pass is the border with the Italian speaking part of Switzerland – Nufenenpass = Passo della Novena in Italian. Here are more detailed posts on the south and north sides of Nufenen. 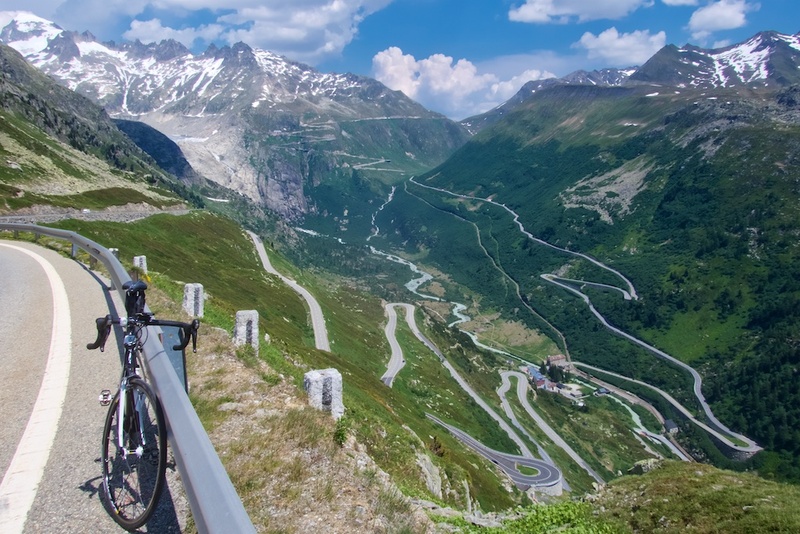 Finally, the old cobbled Tremola road up the south side of Passo San Gottardo (Gotthardpass in German) is one of the truly special high Alps climbs for cyclists. The pass has for centuries been one of the busiest routes linking the north (German speaking) and south (Italian speaking) side of the Alps. The 13th century hospice (rebuilt several times) is still at the summit. The first wheeled carriage crossed the pass in 1775. Today, it’s relatively quiet for cyclists as there is a huge car-only tunnel below, and a better surfaced, more direct road across the pass. Here is a detailed post of Gotthard with lots of photos. The green loop on above map. 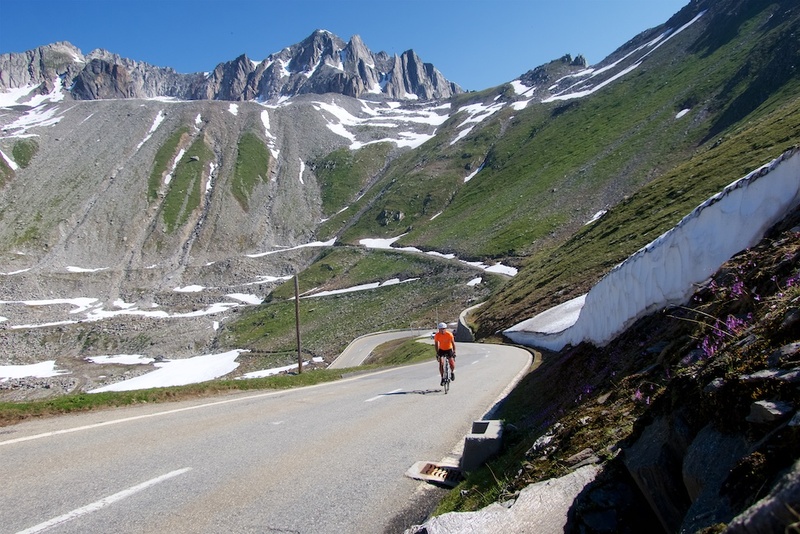 I rode this loop as part of the Alpenbrevet back in 2009 – details here. My loop is the 3rd toughest of the four sportive options – yikes. The sportive still exists, and runs August 2017, see here. This loop could be ridden in either direction. 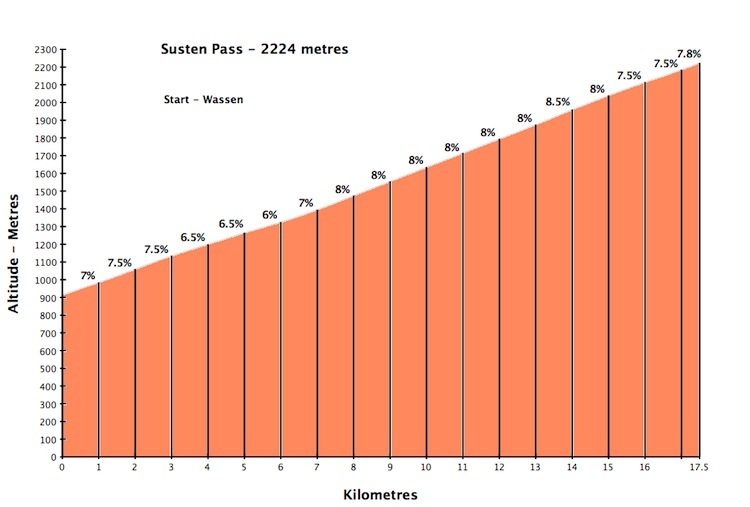 In fact, I much prefer the west side of Susten Pass. 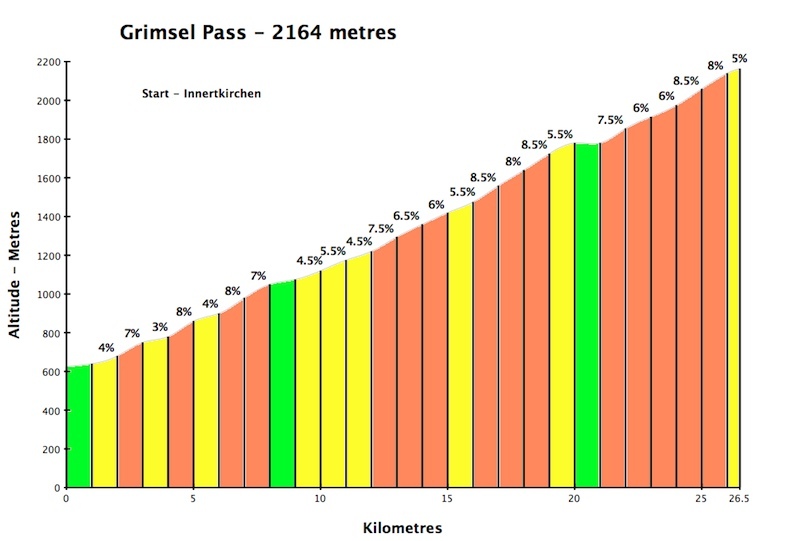 It starts with the north (toughest) side of Grimsel. The highlight of this ascent is definitely the top winding stretches, passing a few dams/lakes. 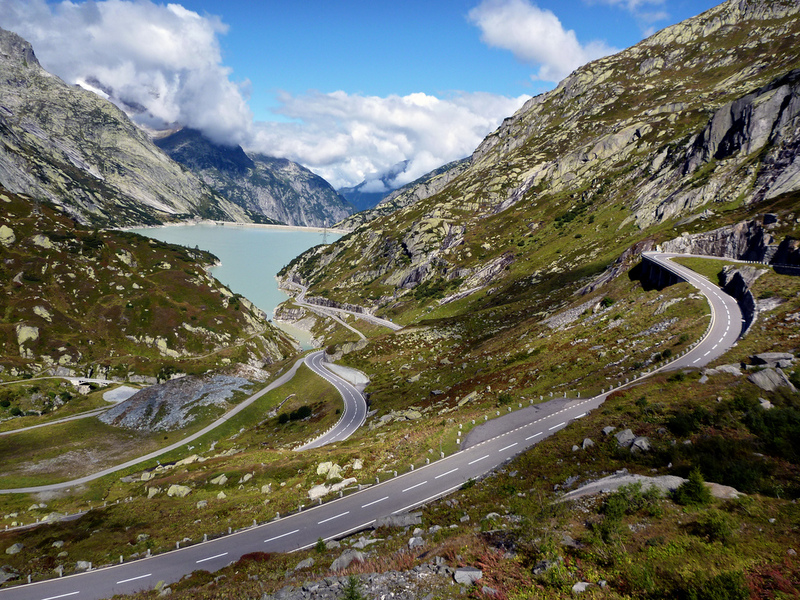 From Grimsel Pass is one of the great “bike” views I know (below). The route descends the hairpins below and then climbs the west side of Furka Pass viewed high in the distance. It’s a magical place. The route only climbs the top half of the west side of Furka. See here for a detailed post climbing the entire west side of Furka as well as the south side of Grimsel. Grimsel hairpins, Gletsch below, Furka in distance. The East side of Susten is a tough grind with discouragingly few hairpins. 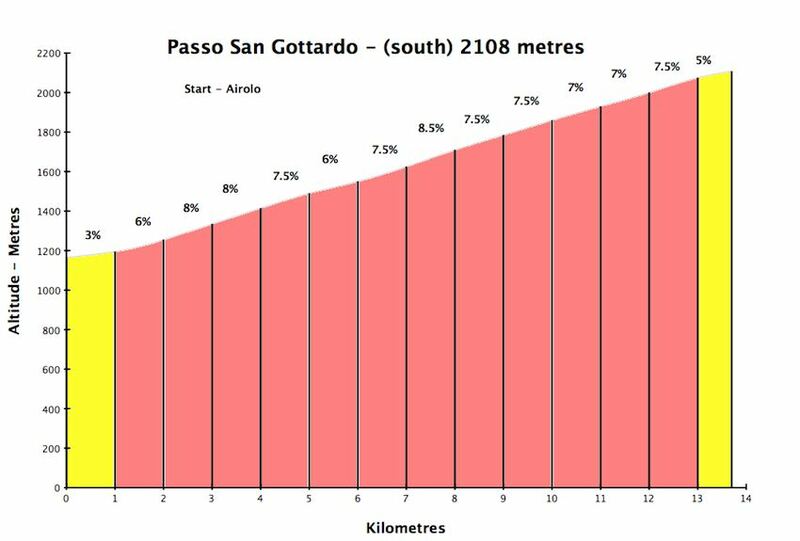 While not my favourite of all these climbs, it is still a huge and beautiful ascent. Again, I prefer the west side details here. Lots of interesting views and rugged (not scary) tunnels. The pink line on the above map. At first, I was just going to discuss the central climbs that are easy to make into loops. 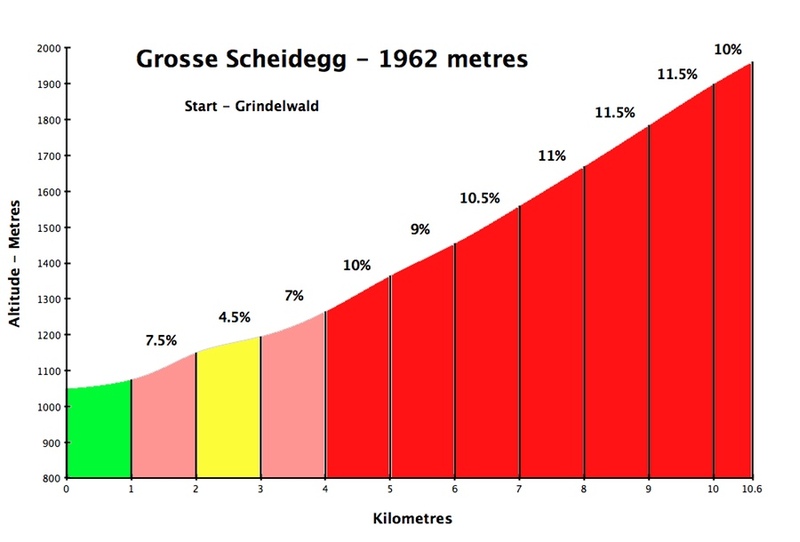 But nearby Grosse Scheidegg is so good that it seemed wrong to exclude. Both sides of this climb are as beautiful as it gets, with hairpins directly below some of the highest peaks in the Alps – including the legendary Eiger North Face. The higher stretches of both sides are closed to car traffic. But watch out for the buses. This post discusses both sides in detail. 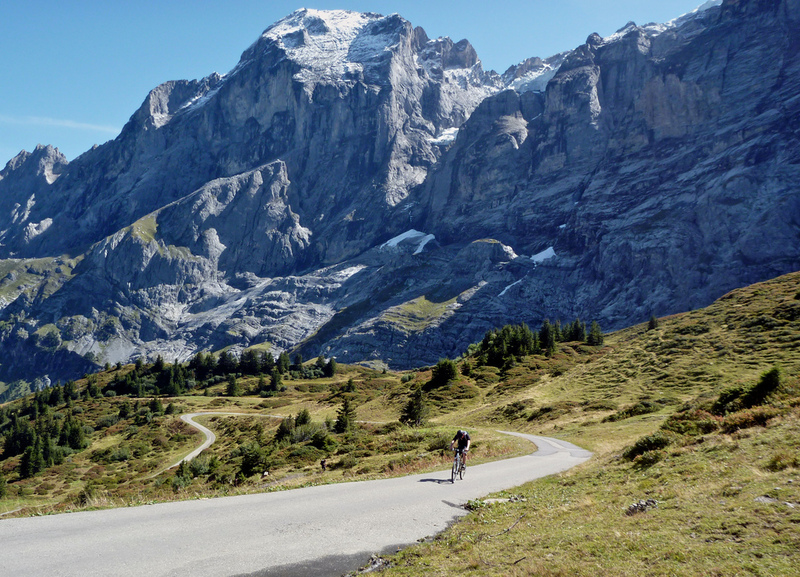 And while I’ve been focusing on road cycling, this post includes a truly amazing unpaved extension high above Grosse Scheidegg to First and then the Bachalpsee. Another superb paved climb near Grosse Scheidegg. A steep, deserted road to a summit full of tourists that have taken the cable car. You can reach 2220 metres on a road bike, with views beyond belief. Amazing place. Follow the higher details in the map linked here to ensure you stay on a paved road. 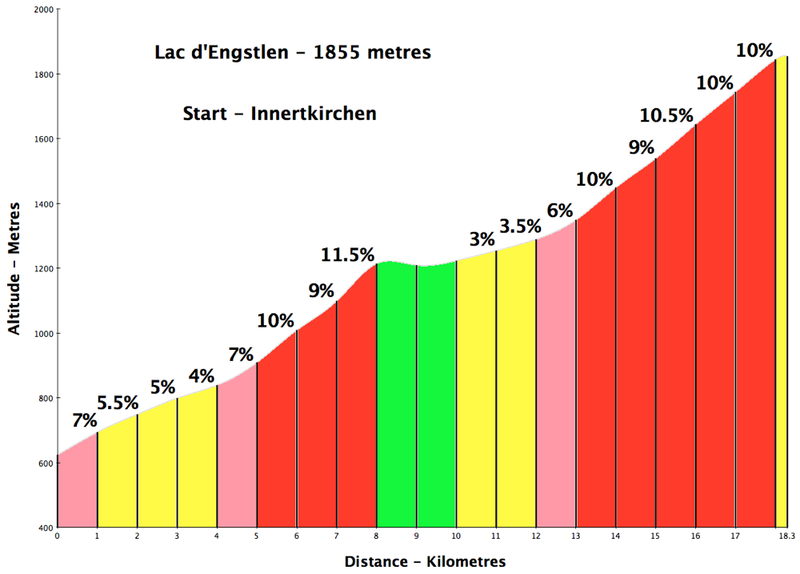 Lac d’Engstlen – details here. The brown route on the above map. The purple route on above map. 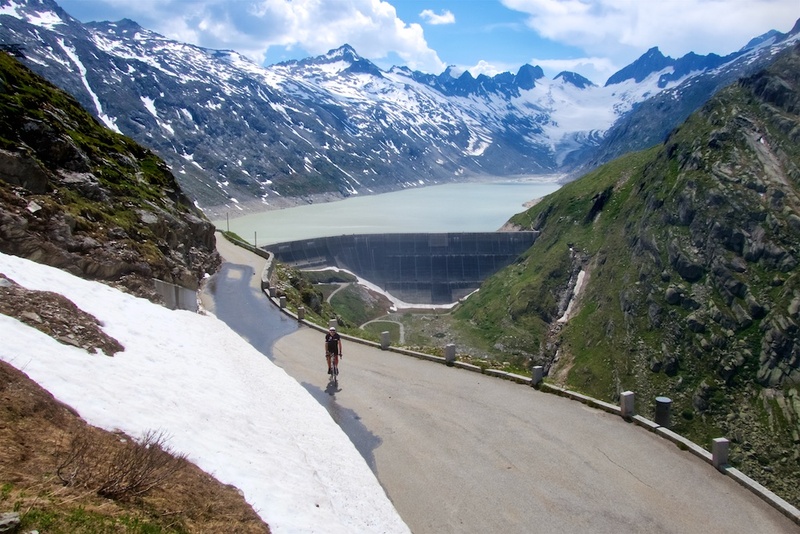 The fifth highest paved road in Switzerland is a little 6 km extension above Grimsel Pass to the Oberaarsee dam/lake. 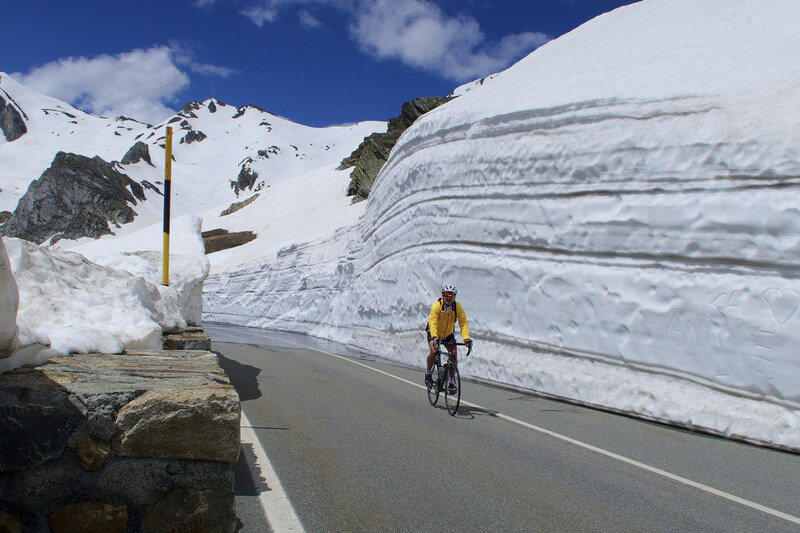 An amazing road – closed to cars when I rode it. Details here. The grey route on above map. 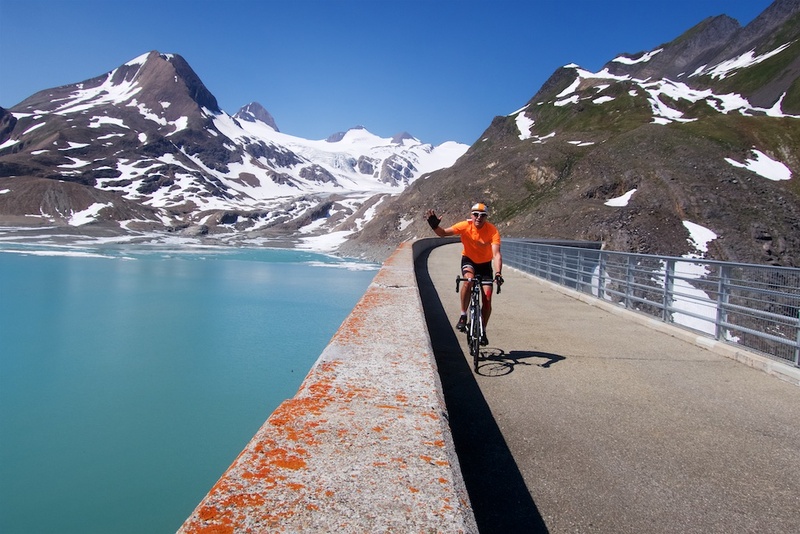 Just 2.5 kilometres, this short, paved extension near the summit of the west side of Nufenen Pass leads to a stunning dam/lake and views of the Gries Glacier. On the dam. Gries Glacier in distance. The thin black line on above map. Looking for a real challenge? 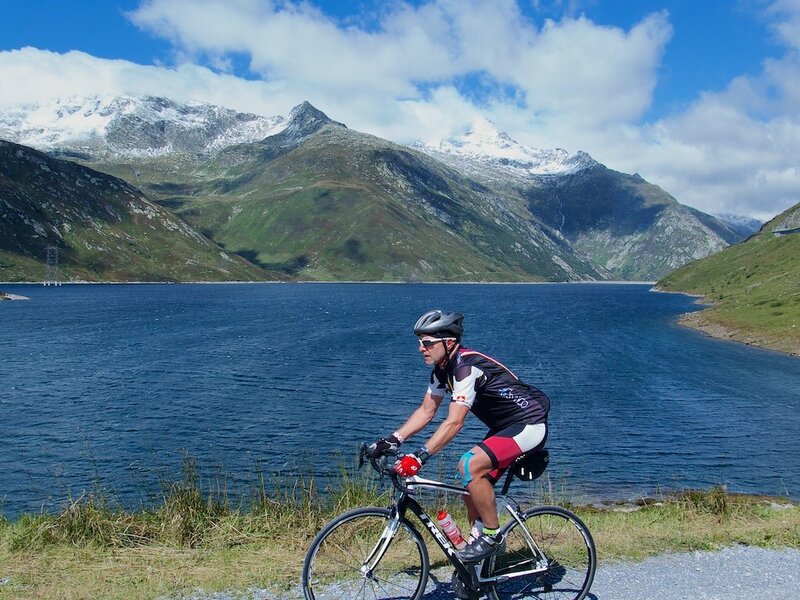 The long route in the Alpenbrevet is 276 kilometres with obver 7000 metres of ascent. Details here. For me, this would require a hotel mid-route. 😉 In addition to Grimsel, Nufenen, and Susten passes discussed above, it includes Lukmanier, and Oberalp passes. Wow. This was a whirlwind tour of some of the best paved climbs in central Switzerland. I can’t recommend the region enough. Feel free to add any other favourite ideas. 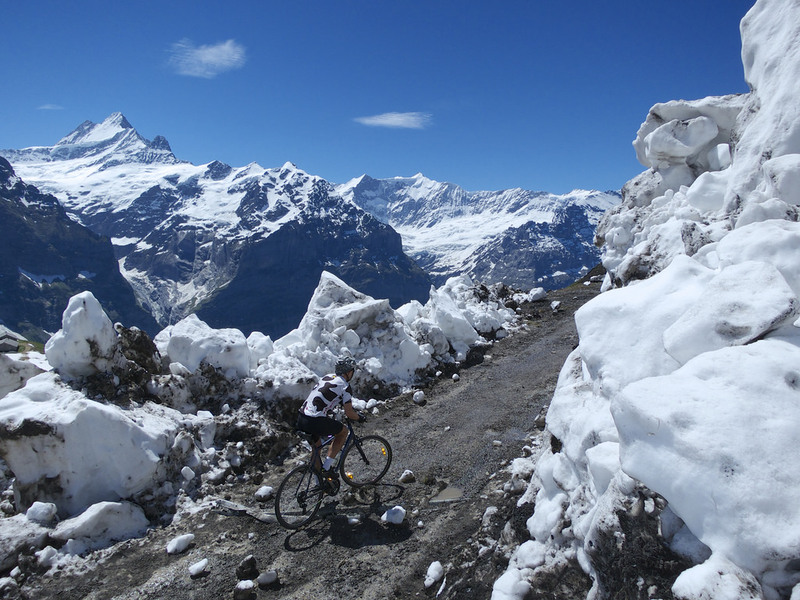 See here for details on the 20 highest paved climbs in Switzerland. Stunning photos, Will. This area is at the top of my to-do list for 2018. I suspect, like the Nivolet, it may then be added to my to-do-again list! Nice write-up! Meiringen is such a great place to stay when in central Switzerland… A fantastic climb in every single direction you leave the town! Hi Will. I moved to Bern last year, and your website has been an amazing source of inspiration for me! This is a great list… maybe add Panoramastrasse to your list, which is a huge climb closer to Luzern. With a name like that, you know it’s going to be good… Then there’s also the Gurnigel closer to Bern, which from the West is a great climb for those starting out with Alpine riding. Great post thanks. 6 of us are staying in Munster Geschinen for 5 nights next June. As we’re getting there by plane / train we were hoping to hire bikes out there. Do you know any hire facilities in the area? We change trains in Brig so that could work if we can’t find anything closer. Otherwise it’ll have to Geneva. Sorry, I am no help with that.